The Gold Mine: To start Mayfield, or not? 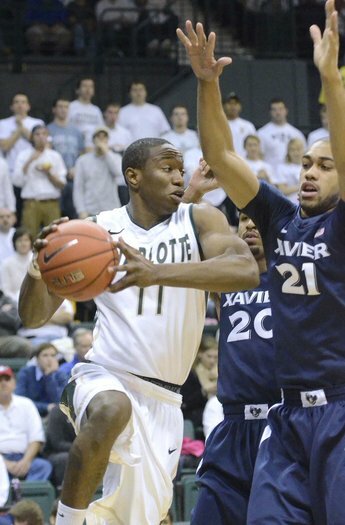 DeMario Mayfield has broken into the Charlotte 49ers' starting lineup. Now coach Alan Major needs to figure out if he wants to keep him there. It's not a question of whether Mayfield, a versatile junior guard, should be playing. He's been the 49ers' most effective offensive player for much of the season and averages 26.4 minutes per game (second on the team to point guard Pierria Henry). But until he got his first start last week against Xavier, Mayfield had done what all excellent sixth men do: bring energy and an ability to change the course of the game that's already a few minutes old. That wasn't a factor against Xavier, a close game all the way that Charlotte won 63-57. But the 49ers might have fared better in a 82-54 loss against George Washington had Mayfield been able to come in and potentially provide a spark, rather than be part of a sluggish Charlotte start that quickly dissolved into a blowout defeat. With the 49ers (16-4, 4-2) off all week before playing a home game Saturday against Massachusetts, Major said he'll keep thinking about whether Mayfield is more valuable as a starter or sixth man. Mayfield is now Charlotte's leading scorer at 11.7 points per game(14.3 in league play). "It's tricky," said Major. "Sometimes you don’t want a guy feeling that if he starts the game that he's got to do it right away. It can be a little easier coming off the bench, when you know exactly what you’re going to do. Either way it's a positive and a good problem to have. We have to manage it the right way. "We'll take a look at that and see if it warrants keeping him in there." A factor in Major's decision is whom Mayfield is starting for. Freshman Denzel Ingram has been inconsistent (he started alongside Mayfield and Henry in the backcourt against Xavier and had 12 points, but was scoreless off the bench against GW). Sophomore Terrence Williams (benched against Xavier but back in the starting lineup against GW) continues to struggle with his shot (31.5 percent). -- The 49ers picked up a football commitment last week from defensive lineman Wolfgang Zacherl (6-4, 272 pounds) of Raleigh Broughton. -- The 49ers started baseball practice on Saturday. Charlotte, which opens its season Feb. 15 against Delaware State in Hayes Stadium, will host the Atlantic 10 tournament in its final season in the league May 22-25. How about putting Braswell back on the bench? He was the leading scorer when he was the 6th man, but since he got back in the starting lineup in January he has done almost nothing. ONE rebound against GW? Bras has talent, but no work ethic, and plenty of attitude. Go back to the starting five we started with. How about asking if he should start Braz or not? This offense is 'un-watchable' and it's starting to catch up now that we're in league play. Second, I don't see a problem if a guy has the mentality to come in and score right away. I think it's a problem to NOT want these players to have that mentality. Nothing wrong with getting out of the gates quickly and applying some pressure on the offensive end of the floor. I think Henry, Mayfield, Nickerson, Clayton and Braswell should be the starters. Clark, Thompson, Ingram and Williams are fine coming off the bench. The Niners need scoring so Williams - who is a great defender - shouldn't be on the floor much until he starts shooting better. Can't be a two guard and shoot like he does. Ingram is a good backup for both guard spots while Mayfield can slide to the three to give Nickerson a rest. Clark and Thompson should split time with Clayton and Braswell up front. We are a young team this year, and we will be a young team next, but these are some of the deepest teams we have ever had! Major is really nailing it with recruiting!